What is an automated weather station? 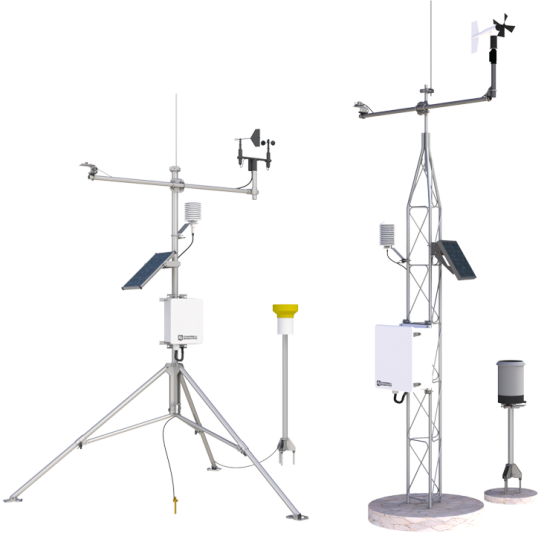 What are the different components of an automated weather station? Where can automated weather stations be used? How do automated weather stations differ from each other? How do you select the automated weather station that is right for your application? 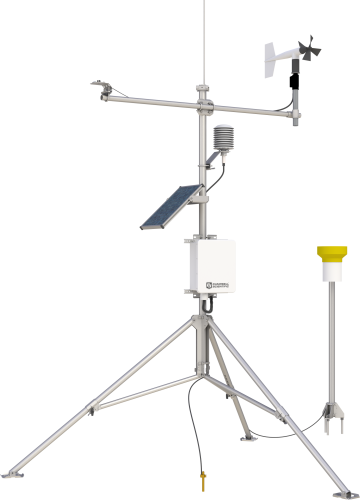 An automated weather station is an integrated system of components that are used to measure, record, and often transmit weather parameters such as temperature, wind speed and direction, solar radiation, and precipitation. Weather stations are used on land and sea for a variety of operational and research purposes. Rugged design, low power requirements, and long-distance communications methods allow modern weather stations to operate remotely for long periods without the need for human intervention. Note: Similar terms for "automated weather station" include "automatic weather station," "met station," and "meteorological station." Which term is used often varies by industry or discipline. Weather stations vary greatly in their level of sophistication and complexity, as well as their flexibility and ability to measure, monitor, and study weather and climate conditions. For example, some weather stations require manual collection of the measurement data, while other weather stations are highly automated. Manual reading and recording of weather measurements can be done by visiting the site where the weather station is located, viewing the measured values, and logging the data by hand or by using a handheld electronic device. This process can be a cost-effective solution for short-term weather monitoring programs or for infrequent measurements. However, for frequent measurements, long-term monitoring, remote monitoring, or measurements at multiple locations, manual measurement recording can be inconvenient and labor intensive. Not only do trained personnel need to be available to record the measurements, but some site environments may pose safety concerns for personnel. Automated weather stations measure and record meteorological variables over extended periods without the need for human intervention. Automated weather stations offer the convenience of unattended, long-term monitoring at multiple remote locations, thereby reducing the time and cost associated with frequent measurements. In addition, the possibility of human error in data collection is minimized. For more information, review the following source: Bertrand D. Tanner, “Automated Weather Stations,” Remote Sensing Reviews 5, no. 1 (1990): 73-98. The durability and low-power needs of some automated weather stations can make them an appropriate choice for harsh climates and remote locations. Some automated weather stations are so versatile that they can be configured in many ways to record, monitor, and study weather patterns over time, as well as regional climate changes. In fact, the data from multiple networked automated weather stations, such as in a mesonet, can be transmitted to a centralized location where the data are compiled, reviewed, analyzed, and shared. For the purpose of this discussion, our focus will be on automated weather stations that measure and record meteorological variables over extended periods without the need for human intervention—rather than on stations that require manual intervention. Each sensor is tailored to measure a single or multiple parameters, convert each measurement to an electrical signal, and transmit the signal to a data logger. The transmitted electrical signal is often conducted through a sensor’s wires, which may require specialized connectors. Alternatively, the transmission can be conducted via wireless communication. The number of wires or the type of connector the sensor uses depends on the type of signal the sensor outputs. The signal type, in turn, varies across the many different sensors. Some common signal types include voltage, current, pulse, digital, and serial. When wireless interfaces are integrated into the sensor, the data logger must have a matching wireless device. Note: Technically, a measurement and control device, such as a PLC (programmable logic controller) or RTU (remote terminal unit), can be used instead of a data logger in an automated weather station. However, for the purpose of this discussion, our focus will be on general-purpose data loggers, which tend to offer more flexibility for an automated weather station’s application. For example, a flexible data logger is easy to install in the field for remote monitoring, is durable enough to withstand continued use outside, and has low-power needs for unattended applications. The data logger can be programmed to scan the sensors repeatedly after a specified interval has passed (the scan rate), under specified conditions, or after the occurrence of a particular event type (such as rainfall). A sophisticated data logger can receive the electrical signals from the sensors, perform any programmed calculations, convert the data as necessary to other units of measurement, and store the resultant data in the data logger’s memory. In addition, the data logger can perform control operations, similar to a PLC or RTU. The signal output from the sensor must be compatible with the data logger input terminal to which it is connected. A data logger may have a variety of input connections to accommodate different sensor configurations, as well as onboard instructions for commonly used sensor types. If different sensor configurations or new data processing requirements are needed, some data loggers’ capabilities can be expanded by using a multiplexer. A variety of methods can be used to store the data logger’s acquired data, as well as transfer the data and any calculated values to a PC or other device for increased access, sharing, analysis, and reporting. These methods employ a variety of communication peripherals with onsite and telecommunication options. Sometimes a data logger can be connected directly to an onsite PC or laptop. Other onsite external memory storage options include USB flash memory, microSD cards, or manufacturer-specific solutions. For many sites, it may be helpful to use a remote telemetry peripheral to provide communication or enable remote data retrieval. There are hardwired remote telemetry options (Ethernet, multidrop network, satellite, short haul modem, landline phone, and voice-synthesized phone), as well as wireless options (radio frequency, cellular phone, and Wi-Fi). For an automated weather station to operate, it is necessary to have a reliable power supply. When a station is installed in a location without access to ac power, a rechargeable battery is typically used. The number and size of the batteries needed depends upon the current drain (or power requirements) of the automated weather station (including telemetry), the maintenance interval, and the amount of solar power available during a given time interval (for example, 24 hours) at a given latitude to recharge the batteries. Alkaline batteries require replacing, and a rechargeable battery requires recharging. Recharging a battery necessitates the use of a regulator and a charging source. The charging source is typically either an ac transformer or a solar panel. (Power to an automated weather station can be supplemented with an external rechargeable battery, which is also recharged using a regulator and a charging source.) Sometimes wind turbines, fuel cells, or diesel or gasoline generators are used as charging sources. To protect an automated weather station’s most sensitive components from the elements, a suitably sized environmental enclosure is typically used to house a data logger, communication peripheral, power supply, and some sensors. 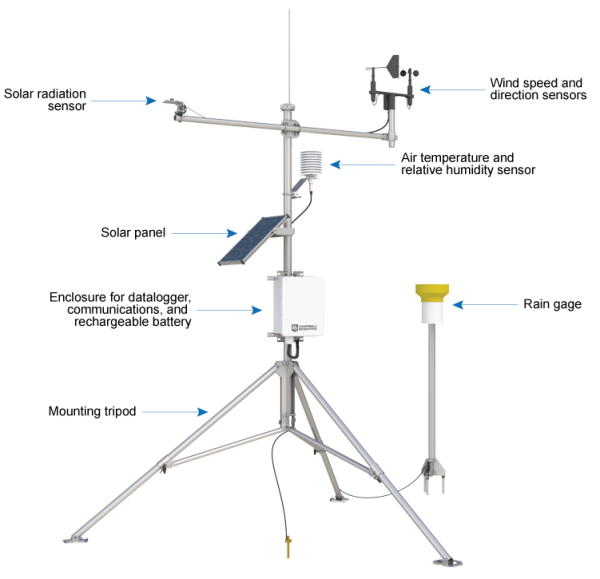 An automated weather station’s components, whether placed in an enclosure or directly exposed to the elements, are grouped together and physically supported by mounting them to a stable structure, such as a tripod, tower, or buoy. To meet different measurement requirements, a variety of tripod and tower heights are available. While many automated weather stations are designed to be installed in moderate environments, some are specifically designed for extreme environmental conditions. These extreme environments include mountainous terrain, deserts, jungles, mines, oceans, and ice floes. An automated weather station is often left unattended for lengthy periods to automatically process and record measurement data from a variety of sensors until the monitoring period ends, which may be decades later. An automated weather station may be positioned to collect data from a single location, or multiple stations may be networked (such as in a mesonet) to acquire data for a larger geographic area. It is important to note that different manufacturers do not use the same criteria for classifying automated weather stations. For example, a station considered by one manufacturer to be a “professional” instrument may be considered by another manufacturer as suitable only for home-based personal use (such as a hobbyist mounting a station to a roof). Because the terminology used to categorize automated weather stations is not consistent, it should not be relied upon solely to differentiate among automated weather stations. Rather, it is important to understand the intended purpose of an automated weather station, as well as its siting, and to consider the quality-related characteristics that affect the probable success of the station to fulfill that purpose. Accuracy is the ability of a measurement to provide a result that is as close as possible to the actual value. Precision is the amount of agreement between repeated measurements of the same quantity. Resolution is the smallest change in a quantity that can be detected. Although an automated weather station’s quality is reflected in its accuracy, precision, and resolution, these characteristics are not directly correlated. For example, just because an automated weather station can provide very precise measurements, the measurements are not necessarily highly accurate. Automated weather stations are built for different purposes. For example, a simple station that records outside air temperature and humidity with low measurement quality (accuracy, precision, and resolution) may meet the data needs and low-cost requirements of a weather hobbyist. On the other hand, an organization whose primary business or purpose is to obtain and distribute weather information may need a more sophisticated automated weather station with better measurement quality to record not only air temperature and humidity, but also barometric pressure, precipitation, wind direction, wind speed, and other parameters. The reliability, or consistency over time, of weather measurements conducted by a weather hobbyist may not be a critical factor, as the weather hobbyist may only need intermittent data. The same is not true, however, for a national weather reporting agency that depends heavily on an automated weather station performing consistently day in and day out to deliver data for the prediction and reporting of severe storms. Longevity is a critical factor when considering the purpose of an automated weather station and how it will be used. A weather hobbyist who has spent a minimal sum for a personal station may not be concerned if it begins displaying erratic measurements or fails completely and needs to be replaced after a short period. In contrast, an organization whose primary business is to obtain, evaluate, and distribute weather data and has spent considerable resources for data acquisition will expect its automated weather station to be durable and provide long-term monitoring. In many cases, the flexibility and expandability of an automated weather station is determined by the data logger used. Data loggers can vary greatly in their flexibility. Some data loggers can only be used to follow the preprogrammed instructions of the manufacturer. These data loggers can scan sensors and record measurement data only at the intervals set by the manufacturer. Other data loggers can be configured within certain limitations. There may be a few interval options to choose from for these data loggers. Still other data loggers offer diverse programming options to the user. Using the programming language, these data loggers may be set to measure and record data at an interval, under specified conditions, or in response to an event (such as rainfall). In addition, there is significant variability in the sensor compatibility of different data loggers. Some data loggers can only scan the sensors supplied with the data logger, others only scan sensors from a supplied list, and still other data loggers have a broad enough selection of terminals to measure nearly any sensor with an electrical signal. Data loggers that offer options for flexibility and expandability can vary in the number of terminals they offer (determining how many sensors or other devices can be connected), as well as the types of terminals they offer (determining which types of sensors or other devices can be connected). Both current and future needs for expandability can be addressed by selecting a data logger and any necessary, compatible expansion modules, such as a multiplexer. A flexible data logger enables the ease of removing and adding sensors as necessary to acquire the desired measurements when they are needed. All automated weather stations are either portable or permanent in their design. It is important to note that the terms “portable” and “permanent” may be used to cover a breadth of automated weather stations that vary greatly in their sturdiness and stability. For example, a station labeled by one manufacturer as “portable” may be, in fact, sturdier than another manufacturer’s “permanent” station. Typically, a portable automated weather station is considered one that can be moved easily from one site location to another. (If required, however, a portable station can remain at a single site.) Oftentimes, a portable station is installed using a tripod secured directly to the ground. A guy wire kit can be used to increase the stability of a portable station. Some applications require a portable station that can be set up quickly to monitor weather conditions for a short period. For example, a portable automated weather station is used for prescribed burns to monitor the wind conditions and help ensure that fires remain controlled. As another example, a portable automated weather station is used at a hazardous chemical spill to monitor soil and weather conditions for chemical drift and hazardous fumes. A permanent automated weather station is designed to remain at a site for an extended period. (If required, however, a permanent station can be moved from the site.) Oftentimes, a permanent station is installed using a tower secured to a user-supplied, ground-based concrete pad. A turnkey (or ready-to-use) station requires minimal setup after removal from its packaging because it typically can only be operated in a single way, and there is either minimal or no configuration required. A prewired or preconfigured station typically comes with a standard suite of sensors prewired to the data logger, and the station offers some configuration options. With a custom station, often the sensors are individually chosen to match the needs of the application and site, and the sensors are not prewired to the data logger. A custom station offers the most configurability. To the general public, a turnkey automated weather station is usually a simple, low-end model with limited functionality and an easy setup process. For example, after an analog station has been removed from its packaging, its only setup requirement may be to place it in the desired location. As another example, a digital or wireless station for a hobbyist requires a power source and perhaps minimal configuration of the display unit. If separate sensors are included, they require proper placement and/or mounting. Professional-grade turnkey automated weather stations are also available. In an installation for a prewired or preconfigured automated weather station, the organization can make some selections regarding which models of components are used. The prewired or preconfigured station has a set of components that have been configured by the manufacturer to work together, but some assembly for their connection may be required. For example, the data logger is housed inside an environmental enclosure that may or may not include connectors for attaching the sensors. If connectors are included, they may be keyed, color-coded, and/or labeled. Furthermore, the connectors can vary as to their IP rating and ability to protect against the intrusion of foreign objects or substances. A custom automated weather station comprises a collection of components that, while not fully integrated by the manufacturer, are 100 percent compatible to provide the specific functionality required for the intended application. The manufacturer leaves the integration to the user to provide the highest degree of customization possible. Because the components are not always prewired or integrated by the manufacturer, the installation of a custom automated weather station requires more effort when compared with other types of automated weather stations. Each sensor must be matched and connected to the appropriate input terminal. Determining how to make these connections is dependent upon the specific sensors and data logger being used. A sensor’s instruction manual or the data logger’s program may provide the specific wiring information. Selecting an automated weather station is an important decision that requires careful consideration. For assistance with the selection process, review the detailed Purchase Considerations section. An automated weather station is built at the component level to provide an organization with the instruments it needs to meet its measurement objectives. The versatility of an automated weather station is evidenced in your ability to add, remove, or substitute sensors or other peripherals as your data measurement and monitoring needs change. To assess the numerous research-grade automated weather station models and ultimately determine which components are the most suitable, you should first identify your application's needs and requirements. If necessary, review any related documentation, permits, or regulations. Your familiarity with these items will help ensure that the automated weather station components you select will meet your compliance requirements. For more information, review the following source: Bertrand D. Tanner, “Automated Weather Stations,” Remote Sensing Reviews 5, no. 1 (1990): 73-98. Selecting the appropriate sensors is a critical step for your organization to obtain the data it requires. Different sensor types require different input types on the data logger that can interpret the sensors' signals. Number of sensors Data loggers vary greatly in both the quantity and types of connections (analog or digital) they offer for sensor inputs. You will need to ascertain how many sensor inputs of each sensor type your data logger needs to accommodate your application. Expansion An expansion peripheral can enable multiple sensors to share the same data logger connection, which can significantly expand the number and types of sensors your data logger can measure. If the number or types of sensors you will be using exceeds the inputs available on a data logger, you may be able to use a compatible expansion peripheral. Moreover, consider how your organization's long-term goals may differ from the current goals and require additional inputs and/or outputs on the data logger. While planning for future needs upfront may incur additional cost, additional equipment costs or downtime will not be incurred later. Compatibility You may already own sensors that you plan to use in your automated weather station. Ensure that these sensors are compatible with the data logger you are using. Campbell Scientific automated weather stations are modular, enabling the connection of a variety of sensor types and peripherals to customize a station that best meets your application's needs. Whereas precision and resolution of an automated weather station may be directly related to the performance of the data logger, the station's accuracy is often determined by its least accurate component. Accuracy Accuracy is the ability of a measurement to provide a result that is as close as possible to the actual value. For example, a data logger that produces a measurement within ±0.1 of the actual value is said to be more accurate than a data logger that produces a measurement within ±0.5 of the actual value. Because the overall accuracy you can attain is determined by the least-accurate component in your automated weather station, check that your components provide a suitable accuracy level for your requirements. Note that accuracy levels differ depending on the temperature range. Precision Precision is the amount of agreement between repeated measurements of the same quantity. For example, a data logger that produces 10 measurements of the same sample within ±0.1 of each other is said to be more precise than a data logger that produces 10 measurements of the same sample within ±0.8 of each other. Match the level of precision of your data logger with your measurement data needs. Resolution In measurements, resolution refers to the smallest change in a quantity that can be detected. For example, a data logger that detects a difference to the nearest tenth of a millivolt is said to have a higher resolution than a data logger that detects a difference to the nearest millivolt. To improve your absolute resolution, use the lowest/smallest fixed voltage range possible that will cover the output range of the sensor being measured. Campbell Scientific instruments are reputed to provide high levels of accuracy, precision, and resolution in terms of measurement data. Your automated weather station's location should be representative of the general area of interest that you would like to measure. If the components of your automated weather station are not designed for the environment in which they are located, the instruments may not perform as expected or stop working. Extreme temperatures The high and low temperatures at your site will determine whether you can use equipment with a standard operating temperature range. If your site's high and low temperatures are beyond the temperature capability of specific components, select components with an extended temperature range. Quality and durability If the site for your automated weather station is exposed to icing, sand, blowing dirt, salt spray, snow buildup, high winds, hail, or heavy rain, ensure your station's components are durable enough to withstand these conditions. (For example, if a significant amount of snow covers the station's components or slides down next to them, the snow's pressure and weight may cause the mounting structure to crumple.) Assess the quality and durability of your equipment and the likelihood that it will fail. The failure of one component may affect other components and the quality of the collected data. Obstructions If there are obstructions near your automated weather station, you may need to select mounting options that ensure your measurements aren't adversely affected. For example, you may need to use a taller mounting structure to raise your measurement height. For more information, review the Weather Station Siting web page. Man-made damage Consider how susceptible the site location is to man-made risks such as off-road vehicles, golf balls, or bullets. As necessary, camouflage your automated weather station to make it less attractive to potential vandals. Wildlife interference Station performance and data accuracy can be affected by a bird that views a rain gage as the perfect home for its new nest. Select sensors that are designed to prohibit wildlife interference. For example, select a rain gage with a spike strip to prevent birds from nesting in the gage. Water exposure If your automated weather station will be placed in a humid or wet environment, check that the components can handle the moisture level and possible corrosion from salt spray. You can protect your data logger and other sensitive components by housing them inside a sealed environmental enclosure. If applicable, select an enclosure and connectors that are corrosion resistant, or eliminate the use of connectors completely by terminating the sensors inside the enclosure. Select an enclosure of a suitable size to house the necessary components. To keep the inside of the enclosure dry, use desiccant. Either schedule maintenance intervals to replace the desiccant, or measure the internal enclosure humidity (using an enclosure humidity sensor or a replacement humidity indicator card) to determine when replacement desiccant is needed. Lightning If your automated weather station is in a lightning-prone area, equip the mounting structure with lightning-protection measures. Vibration If your automated weather station will be subjected to vibrations—such as from mines or construction sites—ensure your components are designed to endure those conditions and mitigate potential measurement errors. 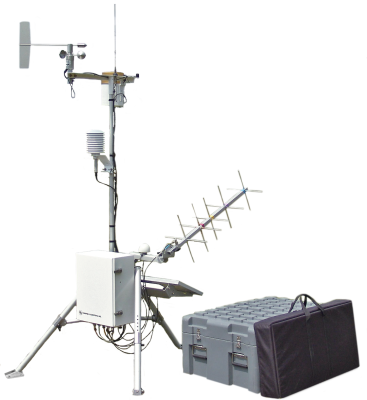 Multi-function use If the site for your automated weather station could be used to provide different measurement data for different seasons, equip your station with the appropriate sensors. For example, outfit your station to provide fire-weather measurement data in the summer and avalanche-forecasting data in the winter. Campbell Scientific equipment is designed to be rugged—even in harsh, remote environments or in applications requiring unattended, automated, long-term monitoring. The length of the intended measurement and monitoring period may determine whether a portable or permanent automated weather station is needed. Portability Decide whether an automated weather station will remain in a fixed position or if it will be transported from site to site. This will help you determine whether a permanent or portable station installation is appropriate. A portable weather station can be moved easily among multiple sites that require infrequent or temporary monitoring and measurement. A drawback to a portable station is that it may not have the necessary reinforcement or guying intended for a station that is deployed for decades and eventually exposed to extreme conditions. Footprint Because of the way a portable weather station is anchored (typically using a guy wire kit), it may have a larger footprint than a permanent weather station. Ensure that the intended site location can spatially support the mounting of your selected automated weather station. Campbell Scientific offers both portable and permanent automated weather stations. Programmable data loggers offer options for scheduling scans, as well as developing and running customized programs. Measurement flexibility A programmable data logger can be scheduled to scan a sensor based on a programmed scan rate, under specified conditions, or in response to an event. Some data loggers don't require the recording of every single measurement from the scans. For example, if a sensor is scanned every five seconds (the scan rate), only an average reading for a 15-minute period (the sample rate) may need to be recorded. Make sure the data logger you select has a level of flexibility appropriate for your needs. If your application requires a higher scan rate, which uses more power, ensure that the station's power supply is sufficient to meet those demands. Programming language While some data loggers are hard-coded to only perform a core set of functions, other data loggers have a built-in, full programming language to allow users the flexibility to develop and run their own customized programs. Determine the skill level of the user who would potentially program the data logger, as well as the needs of your facility to develop its own programs. Select a data logger that will match well. Onboard processing A sophisticated data logger may have onboard algorithms that can calculate daily minimums, maximums, averages, totals, or other statistical values. Moreover, parameters such as the following may be calculated using the data provided by sensors: density altitude, dew point, evapotranspiration, heat index, and wind chill. Data storage flexibility By providing onsite statistical and mathematical processing, a sophisticated data logger can record just the calculated values rather than all the measurement values. This minimizes the amount of data that needs to be stored and transmitted by the data logger, prolonging the time before your data logger's memory becomes full and the data need to be downloaded. In addition, with less data, the cost to retrieve the data may be reduced (depending on the method used), and the data analysis or review process may be simplified. External device control Some data loggers can be programmed to control external devices, such as activating a device at a preset time or in response to a measured condition or event. Data loggers can activate or shut down motors, gates, pumps, purifiers, valves, injectors, etc. If you need the data logger to control external devices, verify that the data logger, or the data logger combined with a terminal expansion peripheral, has this capability. Campbell Scientific data loggers are backed by a built-in, full programming language to enable the customization of programs for your automated weather station application. 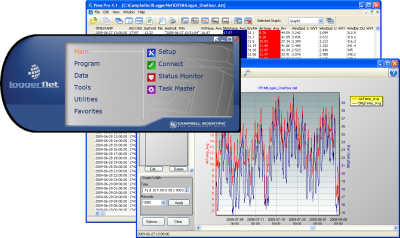 In addition, a free, menu-driven, PC-compatible software package that simplifies the creation of data logger programs is available for download. The value of your measurement data lies not merely in its collection, but in your ability to use the data when, where, and how you need to, such as transferring data to databases or directly to users; closely watching the real-time data; monitoring averages, maximums, and minimums; reviewing a set of historical data; or looking for trends or patterns over a longer period. Frequency of scans and records Knowing how frequently the sensors are scanned, and how frequently data measurements and/or calculated values are recorded, provides helpful information in determining how long a data logger can record data before the memory capacity becomes full and requires downloading. Storage capacity Selecting a data logger by memory size alone may not prove advantageous. Instead, it may be more beneficial to consider storage capacity in terms of how many readings the data logger can store. It is possible for a data logger to have many kilobytes or megabytes of memory but only be able to hold a small quantity of readings. Review the data logger's specifications for both the memory size and the quantity of readings the data logger can store. If the data logger's onboard memory capacity is not sufficient for your project, find out if compatible memory expansion peripherals are available. Memory type Review the specifications for a data logger to determine if it uses fill and stop memory, or if it uses ring memory. This can help you determine how frequently your facility needs to download the data, and then you can schedule your data retrieval accordingly. Battery-backed data storage If a data logger loses power because of a power failure or from being powered down, it is necessary to ensure that your data will not be lost as a result. Different types of storage media provide different protection in this regard. A volatile storage medium, such as SRAM, will eventually lose its data. Consequently, a volatile storage medium should be battery-backed to ensure the data is maintained while the data logger is disconnected from its main power source. Non-volatile storage media, such as EEPROMs and flash memory, are not affected when the power supply is disrupted; they will maintain their data. If you anticipate that the power supply to your data logger may experience frequent planned or unplanned power outages, select a data logger with either a non-volatile data storage medium or with a battery-backed volatile data storage medium. 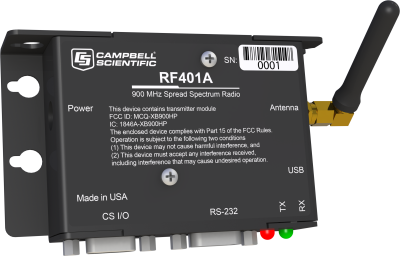 Campbell Scientific offers numerous communication peripherals to assist with the data storage needs of your automated weather station. The ability of a data logger to communicate with other components in your automated weather station depends on the communication protocols the data logger uses, the data logger's integrated communication capabilities, and the data logger's compatibility with communication peripherals. Communication protocols Data loggers vary in their support of the different communication protocols available, such as DNP3 or Modbus. Review the data logger's supported protocols to determine if the data logger shares a common communication protocol with your other station components. IP communications Determine if the data logger has integrated IP communication capabilities, such as an integrated Ethernet terminal, or if it can be integrated with an external communication peripheral. Remote or direct access If it is important for you to collect and view your data without having to visit your site, investigate the telemetry options available to you. If remote access is not a concern for you, consider your onsite options. Onsite options Depending upon the limitations of your station site, you may have to rely on onsite options such as cables connecting the data logger directly to a PC or laptop. Another onsite option is to use an external data storage device with a memory card that can be transported and uploaded to a PC at an offsite location. Check the compatibility of the data logger with the various data retrieval and communication options you are considering. If you need to use a cable to connect your data logger and computer, calculate the cable length you need. A standard RS-232 cable may only come in a length of 50 feet. To increase the connection length up to a few thousand feet, a converter is needed. Telemetry If wireless transmission is available, you can use a telemetry peripheral to transmit data remotely. The following are some possible telecommunication options: Ethernet, multidrop network, radio frequency (RF) network, satellite system, short haul modem, landline phone, voice-synthesized phone, and cellular phone. Check the compatibility of the data logger with the various data retrieval and communication options you are considering. Each telecommunication option has its own requirements that should be reviewed. For example, review the transmission distance or area of each option, as well as its applicable service requirements. You may find that a particular option is not available or does not provide the coverage you need. RF network If you would like to use a radio frequency (RF) network, investigate whether an FCC license is required. If there are line-of-sight obstructions, such as mountains, consider using a repeater station to enable the base station to receive data from the field station(s). Notifications and alarms Using a communication peripheral, some data loggers may be programmed to send regular notifications to personnel regarding the current conditions at the site. In addition, if an atypical event occurs, a data logger can be programmed to trigger an alarm (such as a phone call, bell, whistle, light, etc.) to notify personnel who can make any necessary decisions and adjustments. Determine which parameters the data logger will use to automate notifications or alarms, and ensure that the data logger can be suitably programmed. Onsite display Some data loggers offer a built-in keyboard and display, and other data loggers may offer a separate, portable keyboard and display screen. Personnel can use these devices to respond to prompts and messages from the data logger at the station site. Instead of using a keyboard with display to interact with an onsite data logger, it may be possible to use a laptop computer. Campbell Scientific data loggers offer a variety of communication protocols and the capability to interface with diverse communication peripherals. To provide continuous monitoring, automated weather stations require a power supply that is sized to meet the total power requirements of the station. The power supply must be sufficient to handle the current drain of all the sensors, data logger, communication peripherals, and other equipment. Power requirements Review the listed power requirements of your components to understand their typical current drain for both active and quiescent states. If your automated weather station includes equipment with a high current drain, such as cellular phones or satellite transmitters, select a large-capacity rechargeable battery pack. Power distribution Some data loggers can provide the power to operate sensors and other devices. Sensor control To reduce power drain, consider selecting a data logger that is able to switch the sensor power on only when a reading is taken. If your automated weather station application is short-term and the site's location makes it convenient to replace batteries, consider using alkaline batteries. The ampere-hour rating of alkaline batteries decreases in environments with temperature extremes. If your site has temperature extremes, and ac power is not available, consider using a rechargeable battery. If your automated weather station application is long-term or the site's location makes it inconvenient to replace batteries, consider using a rechargeable battery or ac power. If you are using a rechargeable battery, purchase a regulator and a charging source (ac transformer or solar panel). Some automated weather stations are installed in locations that do not have access to ac power and require the use of an internal sealed rechargeable battery or alkaline batteries—in combination with a solar panel. Consider your site's location and if the amount of solar radiation makes using a solar panel a viable option. If your automated weather station is located at a site that receives minimal sunlight, ensure that you will have enough power supply for continuous monitoring. The solar panel must be able to supply enough wattage to recharge the battery, as well as maintain system power, even during periods of low solar radiation. Supplemental and backup power Power to an automated weather station can be supplemented with an external rechargeable battery, which is recharged using a regulator and a charging source. If your automated weather station will use an ac power supply, consider the benefits of a backup battery. Power budget Whatever power source is used, ensure that you will have enough power supply for continuous sampling. Estimate the power requirements of all the components of your automated weather station using a power budget. Turnkey, prewired or preconfigured, and custom automated weather stations differ in the ease with which the stations can be set up, as well as how much latitude there is regarding the ability to set them up in a particular way. Turnkey A turnkey automated weather station is typically sold as a one-size-fits-all instrument and is, therefore, limited in its configurability. For example, it cannot be customized to meet the needs of an application or site. However, because a turnkey station requires very little or no configuration prior to usage, it can be set up quickly. Prewired or preconfigured A prewired or preconfigured automated weather station installation with a standard suite of prewired sensors can provide an easy selection option for an organization with compatible measurement needs. This type of station installation is more simplified than that of a custom installation. Consequently, it minimizes the wiring time and possibility of erroneously connecting a sensor to the wrong input terminal. Custom For an organization with specialized needs or the desire for maximum configurability, a custom automated weather station installation may be an appropriate option. Because the sensors are hand-selected, an organization can choose sensors that meet their needs for accuracy, precision, reliability, and durability. Sensors can be added and removed as needed based on changes to research or project objectives, or funding. However, configuring a custom automated weather station requires the user to have some level of technical knowledge or experience to install and configure each sensor separately. Campbell Scientific offers turnkey, prewired or preconfigured, and custom automated weather stations. 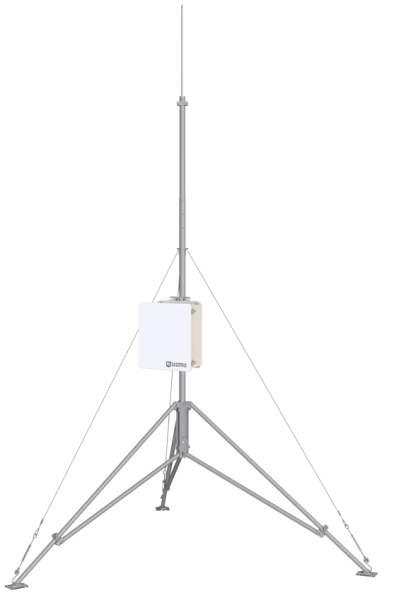 An automated weather station's components, whether housed in an enclosure or directly exposed to the elements, are grouped together and physically supported by mounting them to a structure, such as a tripod or tower. Height Consider the height of the highest measurement level that a sensor must maintain and the corresponding necessary height of the mounting structure. Stability A tower is often secured to a user-supplied concrete pad on the ground. Typically, a tripod is secured directly to the ground; oftentimes, a guy wire kit is used to increase its stability. (If a tripod is located at a site with high wind, consider using duckbill anchors with the guy wire kit.) Consider using a guy wire kit to promote the stability of the following: tripods of all heights, towers that are 20 feet or taller, and towers that are subjected to severe winds and may suffer from wind-induced vibration. If the soil is acidic, standard guy wire could corrode. Use a duckbill heavy-duty anchor kit designed for aggressive soils. If your automated weather station is in an area with uneven terrain, consider using a tripod with individually adjustable legs. Enclosure Determine which environmental factors may negatively impact the measurements at your site, and select an appropriate enclosure that will minimize the effect(s) as much as possible. For example, if you are measuring air temperature and relative humidity with separate sensors, protect the sensors from direct sunlight and precipitation by placing them in a naturally or mechanically aspirated radiation shield. Licensing Investigate whether licenses are needed for the site location, such as for construction or a certified electrician. Depending on the height of the tower, a license may be needed to climb the tower. Transportation Consider not only where the automated weather station will be located, but also how the mounting equipment will be transported to the site. For example, if the mounting equipment needs to be transported in a pack up to a summit, review its weight and length specifications. As another example, if the mounting equipment needs to be transported via helicopter, review the equipment's dimensions to ensure that the equipment will fit within the confines of the helicopter's cabin. Campbell Scientific offers a wide variety of enclosure and mounting options. As with any high-performance equipment, some level of maintenance (cleaning, calibration, and replacement) of the various automated weather station components is routinely required. Planning ahead Review the recommended calibration and maintenance frequency of your station components so you can create a maintenance budget in terms of employee resources, travel time for site visits, and equipment costs. Determine which maintenance tasks can be handled onsite, such as with a field calibration tool, and which require equipment to be sent to the manufacturer. If downtime without data is not acceptable, have sufficient replacement parts (such as batteries) and backup equipment on hand. Campbell Scientific provides factory service, traceable calibrations, and replacement parts for many of its automated weather station components. If you would like some background information regarding the concepts discussed in this section, review the Fundamentals section.